A possible railroad tunnel may be found south of the intersection of Bower Hill Rd and Painter's Run Rd at what was once the mining settlement of Essen. The 1903 (1906 pub.) USGS topo map shows the Beadling Branch of the PCY RR. 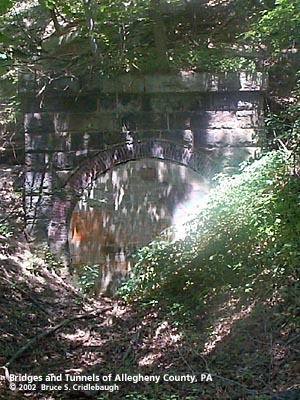 The 3-mile-long branch line ran from a junction near Woodville, south to cross Chartiers Creek near the outlet of Painter's Run (originally Panther's Run). The branch followed the downstream right bank of Painter's Run to a point about 300 feet south of the intersection of Bower Hill Rd and Painter's Run Rd. There is a closed-up tunnel portal in the hillside where the railroad crossed the Run and Bower Hill Rd, entering the hillside. The USGS map indicates the tunnel extended through the small hill and emerged to cross Painter's Run. The railroad then crossed the road and continued east toward Beadling. An eastern tunnel portal is not clearly evident. There has been excavation for businesses located along Painter's Run Rd where an eastern portal should be. Access to the area is limited by private property. Contradictory information on the 1905 Hopkins property map and the numerous coal mines along Painter's Run have led to some confusion in identifying the PCY tunnel. The Hopkins map shows a tunnel extending southeastward to tunnel under Cooks School Rd and emerging at McLaughlin's Run. One of the PCY's predecessors was the McLaughlin's and Saw Mill Run Rail Way Company. If the PCY ever had designs on reaching the Youghiogheny River, a tunnel under Cook's School would have made sense. Contour lines on the most recent USGS map hint at what could have been a pair of cuts leading to a tunnel location. But it appears these clues are misleading and the USGS map would seem most reliable; whereas the Hopkins map may have been speculative. Adding to the confusing evidence -- on a more recent WPA map of coal mining, the Harrison drift is reported as being in this vicinity. The drift extended 1.5 miles northeast to the main workings. It was used to deliver coal to the PCY and was possibly the main entrance to this mine as well. The Pittsburgh, Chartiers & Youghiogheny is a corporation of the State of Pennsylvania, having its principal office at Pittsburgh, Pa. The Pittsburgh, Chartiers & Youghiogheny is controlled by The Pittsburgh and Lake Erie Railroad Company and The Pittsburgh, Cincinnati, Chicago and St. Louis Railroad Company, each of which owns 50 per cent of its capital stock. The Pittsburgh, Chartiers & Youghiogheny was incorporated October 26, 1881, for the purpose of acquiring and consolidating the property, rights, and franchises of the Chartiers and Mansfield Valley Rail Way Company and the McLaughlin's and Saw Mill Run Rail Way Company, and completing and operating the projected railroads of those companies. The mileage owned by the Pittsburgh, Chartiers & Youghiogheny, amounting to 19.634 miles, was acquired by construction. The two predecessor corporations acquired certain right-of-way lands, but did not construct any road or other common carrier property. The two main segments constructed were: From McKees Rocks to Junction No. 1, Pa. [near intersection of Washington Pike and Thom's Run Rd] 1881-82 -- 7.53 miles; and From Beechmont [near Oakdale] to Beadling, Pa. [east of Bridgeville], 1881-82 -- 6.57 miles. A 1923 RR report (in the Articles on this website) mentions the extent of the PCY: "It consists of a line from McKees Rocks to Beechmont, a distance of 13 miles, and of the Beadling Branch, about 3 miles long." Regarding the mines along Painter's Run: The Chartiers Block Coal Company opened mines at Essen in 1882 and sold the operations to Sandford & Co. after one year. William Beadling's parents settled on Saw Mill Run around 1790; William purchased 250 acres in Upper St. Clair and opened Beadling Brothers mines around 1880. Both operations were sold to Pittsburgh Coal Company.